ups: Great gameplay, lots of tracks, multiplayer is a blast. downs: Online portion is rather limited and somewhat clunky. Few racing games out there draw a crowd like those in the Mario Kart series can. And while Mario\'s latest racing adventure, Mario Kart: Double Dash, was met with mixed reactions, that did little to reduce the hype surrounding the next incarnation of the series, Mario Kart DS. And the hype was well deserved. Simply put, if you own a DS you should quit reading now and go buy this fantastic racer. It looks good, plays great, and will spend a lot of time nestled in your DS. Starting with the obvious, we all know the DS isn\'t exactly a graphic powerhouse, but that doesn\'t keep Mario Kart from looking good. The characters and karts, despite being low-poly, have so much personality and unique Mario charm that they are enjoyable nonetheless. The same goes for all the tracks as well. Every track is very unique, lively, and fun in its own quirky way, all while staying true to the original Mario Kart formula. This was one if the big complaints with Double Dash and how it sort-of strayed from what made Mario Kart what it was. But it is obvious that the designers took a ton of time looking at every track and every locale and item to make sure they got things right in this version. And with none of the 32 tracks being like any of the others, you won\'t be getting bored of the scenery or the action. The surround audio also sounds great on the DS. The music is still as cheery and easy going as ever with most tracks having their own unique, catchy theme song. Beyond music there isn\'t a whole lot else in the way of audio. Each character has a few \"Yahooo!\"s or other vocals in case they take the lead or get nailed by an item. The DS\'s speakers also work well to provide that ominous whooshing noise whenever an opponent lets loose the almighty blue shell. While the graphics and audio are good, it\'s the fantastic gameplay and high production values that really take the cake here. The D-pad on the DS works very well providing surprisingly tight and responsive controls. Mario Kart DS is a great example of a well-oiled machine. Everything just works so well. Single player mode is fun and varied, multiplayer racing is an absolute blast, and battle mode is more fun then ever before. And now there are finally bots in battle mode for those of us who don\'t have many friends nearby with DSs. Oh, and if you do have some DS owners nearby who are unfortunate enough to not own Mario Kart DS, then you can still challenge up to seven of them using your Mario Kart DS cartridge alone. With the exception of fewer characters and maps to choose from, this type of multiplayer is exactly the same as if everyone owns a full version of the game. But of course the biggest story with the launch of Mario Kart DS, especially for those of us who don\'t have a load of DS touting friends, is the launch of Nintendo WiFi Connection. And of course with the amazing amount of time put into the rest of the game, you would think sacrifices would be made somewhere, and you\'re right. It is obvious that in order to get the game out for the holiday season, the development team had to cut a lot of options from the online portion of the game. While the actual online system is simple, smooth, and mostly lag-less, it can\'t help but give you that \"bare bones\" feeling. You have a friends list and you can see if any of your friends are waiting for a match, but you cannot just check and see if your friends are online. There is also no online chat or online battle mode. Another inconvenience that seems more like a development flaw than a sacrifice is that you cannot manually select to have a head to head battle with a friend. If you want to race one on one, you need to make sure that both you and your friend are the only ones on each others\' friends lists awaiting a match, then wait in the matchmaking screen until the system quits trying to find more players. Why a simple \"Start Race\" button couldn\'t be added is beyond me. Even with the limited online play, which isn\'t too bad considering it is actually free, Mario Kart DS is easily the best Mario Kart game ever. With 32 maps, even 64 if you count the mirror mode maps, the game has a great amount of replay value with its single player mode alone. 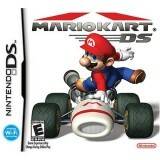 But then add time trial mode, battle mode, multiplayer racing, and online play with other actual racers, and you\'ve got what I am going to call the best DS game of the year, hands-down.